Research appears to show that all women will experience some degree of abdominal separation at least at the end of their pregnancy (I was originally taught that some just stretch to accommodate a growing belly and therefore come back more easily). 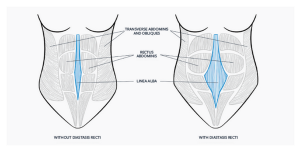 I do know I have seen women with no separation after pregnancy (yet still somewhat lax connective tissue in the linea alba), some with a slight separation, and some (such as myself) with a large gap. Basically, you can still look pregnant, despite otherwise being in fairly good shape. Whilst obsessing over our postpartum tummies is not necessary- it’s good to know whether you have a separation before beginning to exercise again- to ensure the program is healing a separation rather than enhancing it (which will lead to further weakening). 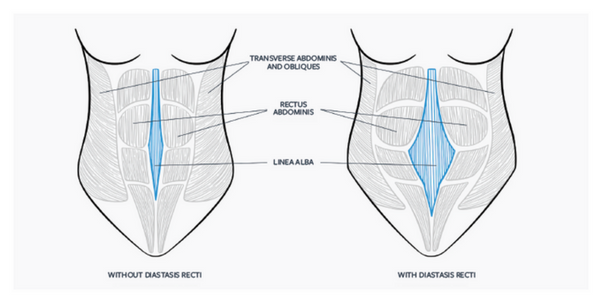 Diastasis recti (also known as abdominal separation) is commonly defined as a gap of roughly 2.7 cm or greater between the two sides of the rectus abdominis muscle. This can even happen to men or even women with poor posture, or when overweight. If you sit back in a chair and slouch, notice the pressure on the centre of your tummy – that pressure could eventually lead to a separation, so men or women could end up with this so called “mummy tummy” at any age (Mat lifeguard). If you have an abdominal separation and start doing common core exercises such as crunches and planks- rather than flattening your belly and giving you a toned honed 6-pack, this can make the issue worse. There are plenty of videos on YouTube about correct exercises to do to help heal a separation- before starting crunches. I have looked at a lot of them and these are the three I find most helpful and send to my students to watch after birth. The first is the easiest to watch But the second two (despite being a bit full-on for early morning watching) have better exercise information than I have found elsewhere. This video shows how to check for abdominal separation & some exercises. This lady shows some progressive exercises. This one is not the most accurate - but I like her and you can see her belly dome when she deliberately performs crunches incorrectly- something that will increase or exacerbate a separation. BECAUSE OFTEN WOMEN FEEL GUILTY & THEY SHOULDN’T! I know first hand how it feels to have a bump several months after pregnancy, and the guilt you feel that it’s due to diet or laziness, or somehow your own fault that you didn’t bounce right back into your skinny jeans. That alone can make you feel demotivated, epecially if you plank like a mad-un and it’s STILL there! Sometimes it just takes a bit of time for the stretched connective tissue of the linea alba to shrink and regain some tone after laxicity (but even in this case, the abdominal knitting together exercises will help heal rather than overstretch the weakened connective tissue). The fact that no one ever told me about abdominal separation, and my postnatal students usually hear of it the first time when I mention it, means there’s a complete lack of information about it. If you have had a multiple pregnancy or pregnancies close together, your abdominal wall is more vulnerable to separation. If we were better informed about this then we would be less likely to be misguidedly attempting to head-butting our own crotch (or, doing frantic sit-ups) in an attempt to flatten tummies for summer- when in fact this is not going to help but hinder progress. PS I am not a medical doctor- I am not intending to diagnose or saying I know everything about this issue, or am completely accurate in my knowledge- if you suspect a diastasis recti I can give you anecdotal information from my own experience and that of working with students- but it’s always best to consult your doctor before starting or changing your exercise routine.